Bits and bobs and varied jobs! The nation has a new hero in the shape of Mo Farah who, after capturing our hearts with his impressive performances at London2012, winning 2 gold medals in the 10,000m and 5,000m, has now become a father to two adorable twin girls called Aisha and Amani. Mo is the UK’s finest ever distance runner – a far cry from his humble beginnings in Somalia, arriving in London from Mogadishu at the age of 8 and speaking very little English. He trained at St. Mary’s University College in Strawberry Hill, a place which played a huge part in my formative teenage years(!) but now lives in Portland, Oregon. In the early days his passion was for football and his ambition was to play as a right winger for Arsenal – perhaps Arsene Wenger should consider adding him now to his decimated squad for this season – it would be quite something to see him doing “the Mobot” as a goal celebration at the Emirates! 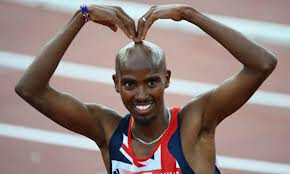 Mo’s build up to Olympic glory started on 14 July 2012 when he was the first ever contestant (celebrity or otherwise) on ITV’s The Cube to win the top prize for his Foundation. Mo managed to not only reach the final game but also had seven lives left (he had lost two lives in his first game.) He won £250,000 only losing one more life in the final game. And then, following his amazing performance in the Games, on 25th August came the birth of his baby girls. 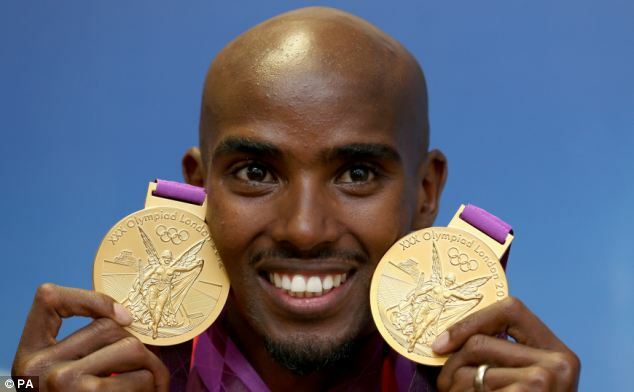 During the games Farah said he wanted to win one gold for each unborn twin, adding: ‘If I only had one, the other would feel left out.’ and he has now vowed to engrave one of the twins’ names on each medal. So, for the second time in weeks he has scored a glorious double and his trademark grin shows just what both these events mean to him. Huge congratulations Mo – we salute you and wish you and your family all the best! Posted on September 4, 2012, in Olympics and tagged 10000m, 5000m, Aisha, Amani, Arsenal, Arsene Wenger, Emirates, Gold Medal, ITV, Mo Farah, Mo Farah Foundation, Mogadishu, Oregon, Portland, Somalia, St Mary's University College, Strawberry Hill, The Cube. Bookmark the permalink. Leave a comment. The random ramblings of a mad woman!